An Ad Agency Shouldn’t Be a Marketer’s Expense Item. | Why Be Tonto? An Ad Agency Shouldn’t Be a Marketer’s Expense Item. More than a few marketers are impatient with their ad agencies. We all know the agency/client relationship isn’t what it once was. In fact, an old joke sums up the mindset of some CMOs. They can be like the Roman Emperor Nero … but in reverse. They burn while their agency fiddles. The best agencies address ROI with strategies that make it easier for their clients to compete. They lower the risk of investing dollars in marketing with messaging that changes hearts and minds. They come up with thinking that creates the moment someone buys. They know the definition of marketing can be boiled down to four simple words. But when clients brand agencies as ‘merely suppliers’ and keep them at arms length, more needs to be done. Maybe agencies could acquaint themselves more with their clients’ problems. Maybe they could develop a greater understanding of the complexities and difficulties marketers face. As they say, advertising isn’t rocket science; but business can be. Their clients are more about management, organizational efficiency, production, marketplace competition and numbers. But agency people and their clients can begin to think both ways with a book that creates revealing talking points. 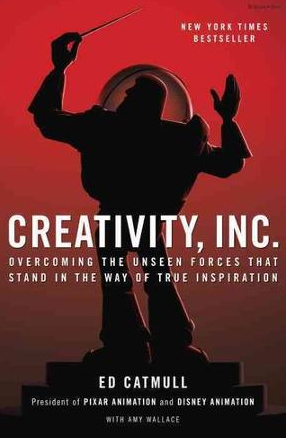 The book is Creativity, Inc. by Ed Catmull. It’s about developing organizational creativity in a company. You get a picture of how to build a business as well as a culture. It’s a culture that puts a premium on thinking that’s the opposite of dull, drab and wearily familiar. Ed Catmull should know about the last as he is a co-founder with Steve Jobs of Pixar. So you benefit with an insider’s view of how Pixar flourished as a creative source and a business. It’s a model companies might want to study. Agency heads could do worse than buying Creativity, Inc. for themselves and a copy for each of their clients. That way they can begin to act less as suppliers and more as partners.